If you’re sick of running out of battery on your smartphone when you need it the most, and don’t mind paying a whopping $2,480 on a coat, you might want to consider getting this solar-powered jacket that can charge your gadgets on the go. COMME des GARÇONS’ alumnus Junya Watanabe first unveiled his FW16 solar-powered men’s coat back in March, but his unique creation is doing the rounds once again, after becoming available for purchase at the hefty price of $2,480. So what makes this coat so special, apart from being a designer item, you ask? 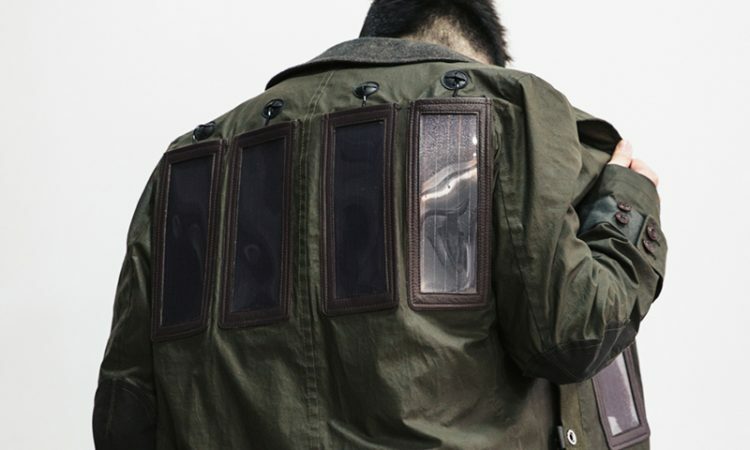 Well, just in case the four large solar panels on the back and the two in the front haven’t given it away already, this coat harnesses the power of the sun, converts it to electricity and stores it in a hidden power pack for on-the-go charging. Considered one of the most eccentric figures in men’s fashion, Junya Watanabe is famous for his radical designs, and the FW16 marks his first entry into the wearable tech sector. While it’s unclear how much time the wearer would have to spend in the sun to harvest enough energy to recharge a power-hungry smartphone, I reckon it’s a lot. But if you’re the outdoorsy type, that’s probably not a problem. And just in case you’re wondering, the FW16 also comes with a phone charging cable, although it’s unclear whether it’s an iPhone connection, a microUSB connection, or the new Type-C. Maybe, it’s customizable. At this price that wouldn’t be very surprising. While the idea behind this solar-powered coat is definitely intriguing, with large capacity power packs getting cheaper every day, do you really need to spend a whopping $2,480 on this thing? Luckily, you don’t have to, because SSENSE actually has it on sale for “just” $1,910. Still not interested? Well, how about this solar-powered bikini then?